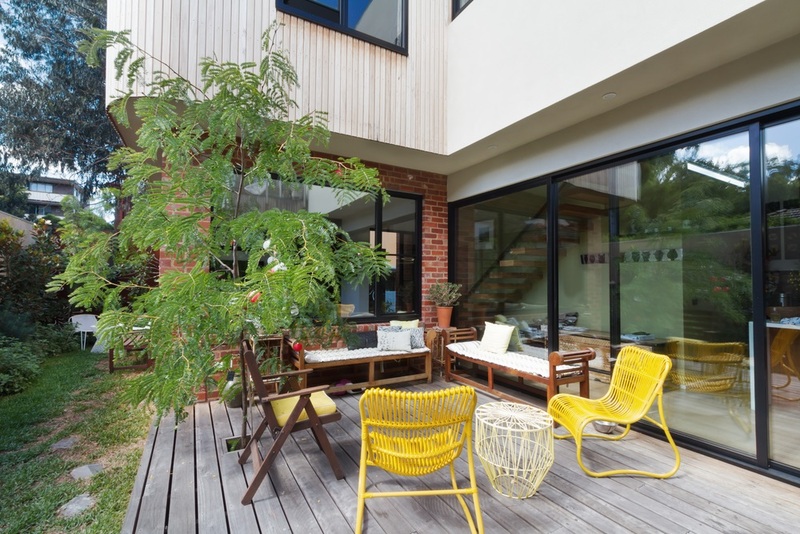 Modern Aussie homeowners love to have indoor-outdoor areas in their homes. Glazed external doors are important to make these areas functional and aesthetic. 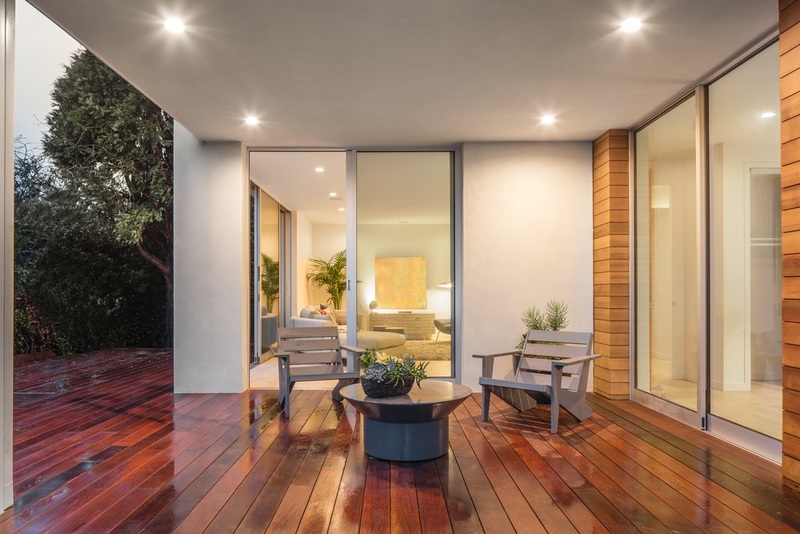 Aside from creating a seamless connection between the interior and exterior parts of your home, it also boosts the energy-efficiency of the structure. Did you know that your windows are responsible for 40% of heat loss during winter and 87% of heat gain during the summer? That’s pretty surprising, isn’t it? This is the reason why choosing the right glazing for your external doors is important. The right one will keep you comfortable at home without maxing your artificial heating and cooling systems, and that significantly reduces your electricity consumption. You have three energy-efficient door and window options: the double– and triple-glazed, and low-E glass. Compared to single-pane, double-glazed windows can reduce heat gain and loss by 30%. Triple-glazed windows look and weigh like the double-glazed variants but it’s a little more expensive. It’s ideal for temperate areas and cold climates. Low-e glass has a thin and almost invisible layer of metallic oxide which minimises heat absorption without blocking natural light. It’s an expensive investment, but it will dramatically reduce your power bills. Acoustic glass – Blocks the outside noise from coming in your home. Privacy glass – Ensures privacy but doesn’t hinder the passage of light. Security glass – Does not break easily compared to a regular single window pane. At the end of the day, choose glass doors and windows that will maximise the views and ensure comfort at home. Go with something that will not take the indoor temperature to the extremes, will not give an annoying glare, and will not let the outside noise in. Now that you have an idea of your glazing options, it’s time to think about your door and window frame. Glass doors, especially the large ones are usually made to order. You can personalise your door frames to be more aesthetic and sustainable too. The most common door frames in the country are made of wood, Aluminium, and vinyl or uPVC. There are composite frames too which looks like timber but durable as Aluminium. Door frames made from Aluminium can handle Australia’s harsh climate the best. These are structurally strong and capable of withstanding strong winds, insane heat, and high levels of moisture. This material doesn’t rust, so it’s great for homes in coastal areas. It’s durable, cost-efficient, and low-maintenance. It’s also light-weight, which makes it the perfect door frame for sliding and stacking doors. The only disadvantage would be Aluminium’s high thermal conductivity. It’s a poor insulator, meaning you can lose your interior heating/cooling through the frame. Tip: Most Aluminium door frames come in silver but you can have them powder coated to a darker/lighter colour. 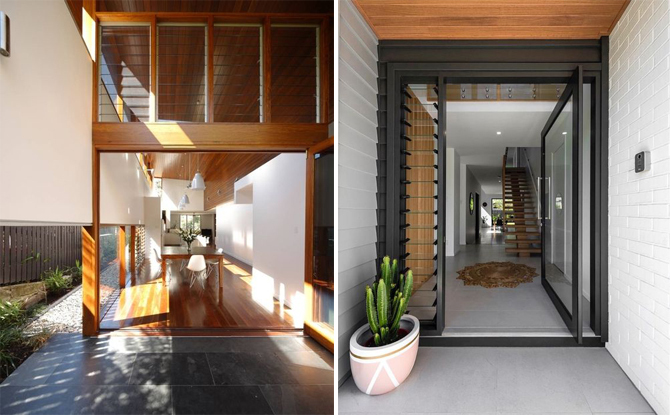 Loved for its warm and traditional appearance, timber is a classic choice for Aussie homeowners. It’s flexible; you can have it polished, painted, or stained depending on your architectural needs. Sustainably speaking, timber has natural insulation properties against the heat and cold. It’s also long lasting but will require regular maintenance and repairs to lengthen its service. There are lots of things to love about vinyl door and window frames. For starters, it’s resistant to all weather and environmental conditions. It requires little maintenance and can be easily washed with soapy water. It also has excellent acoustic properties. Unlike Aluminium door frames, uPVC has low thermal conductivity, meaning it limits the transfer of heat and cold through the frame. It reduces the need for artificial cooling and heating and that makes it more energy-efficient. Vinyl or uPVC frames come in a wide variety of styles. There are pieces in plain colours and there are pieces that look like wood or metal. High-quality vinyl frames always retain their looks even when exposed to elements for a long period of time. The small and rectangular blades of louvres allow for the influx of natural light, ventilation, and connection with the environment. It’s practical because you can adjust the blades based on the direction of the light and wind. You can also have the blades fixed to a certain angle if you like. Tip: Use louvres in your clerestory windows above the glass doors. This way, you can close the glass doors without compromising the ventilation. Shutter doors are usually stationed at the back of glazed external doors to control light, ventilation, shade, and views. You can customise it based on your needs. The louvres can be adjustable or fixed. The shutters itself can also be stacked, slid, or pivoted. It can be installed inside or outside the house. Insect screens will keep the pesky flies, mosquitoes, and other bugs outside. That way, you can leave the external doors and windows open, allowing natural air flow. Simply choose the style, mesh type, and mechanism that suits your needs. Consider retractable insect screens if you have bi-fold, French, or stacking doors. Fit it into the door track to streamline the design. If you don’t have the space for retractable screens, consider the pleated insect screens. It only folds back on itself. Centor insect screens used in conjunction with stacking glass doors. Shading your glass doors outside helps prevent unwanted heat gain in the summer, ensuring your comfort and saving on cooling costs. The shade also limits the exposure of your floor and furniture from the UV rays and keeps it from fading. Consider using eaves to reduce the heat and sunlight that comes in your space during summer. The sun shines at a lower angle during winter, so light and warmth will still shine beneath the eaves. Another option would be retractable fabric and wood awnings. These external window shades are adjustable; it can be extended or closed depending on the season and the angle of the sun’s rays. 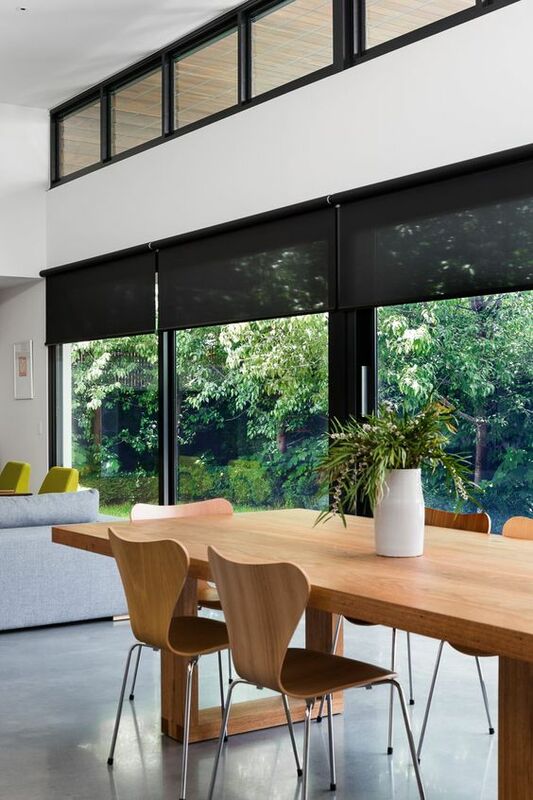 Retractable awnings are either motorised, opened with a hand crank, or fitted with a sun sensor which automatically extends the awning in the sun or folds away in the wind. 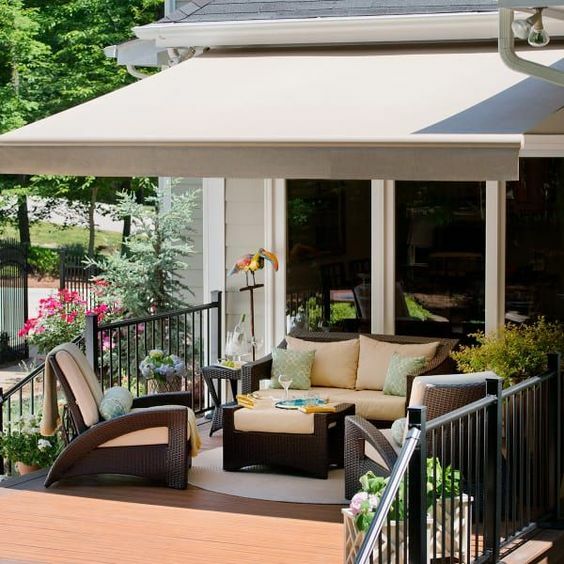 Awnings are the perfect addition to any patio! You will never be blinded by the sun and glare again. Tip: We recommend shading the external doors and windows on the northern part of the house where the noon sun could still enter. The openings on the east and west parts of your home receive low-angle sun rays in the morning and afternoon. You typically need less shade in the morning because the sunlight is not too hot. However, afternoons might get hot and uncomfortable. In this case, trees, shrubs, or plants crawling on timber battens will help screen light and heat. Covering the glass doors from the inside is another method against unwanted heat gain. The most effective window treatments are sunscreen blinds and roller blinds. These completely block the summer sun that you don’t want entering your windows. Fabrics are also good window treatments too. They improve insulation by creating another layer of still air between the windows and interior space, and that reduces heat transfer. But, fabrics vary in their insulating capacity. Heavy and double layered drapes prevent heat loss/gain better than thin, lightweight, and sheer curtains. If you really want to block heat and excess light, consider motorised external Venetian blinds. When fully retracted, it provides an unobstructed view. When closed, it gives you privacy. We hope this answered all your questions about having glazed external doors and windows at home, from choosing the glass, door frames, shading equipment, and window treatments. If you liked this article, bookmark it or share it with your friends! If you’d like to know more about designing an indoor-outdoor area that works for you, you can inquire from us today. Follow us on Facebook, LinkedIn, and Instagram too.